Earlier Hoft wrote about how the NAACP leader present derided Gladney by arguing that he wasn’t black enough to protect. I wrote prior about how, apparently, a HuffPo writer was present. You can see her laughing at the remark in the video. Klassy! PC John Clarke, of Avon and Somerset police, told the hearing of the taunts made by drivers. ‘At some stage the northbound traffic was stopped. This was a great help in negotiating with Paul. ‘But people started shouting ‘jump you ****er’ and ‘jump you b******’. Firefighter Derrick Hone tried to haul Paul to safety using his belt as leverage as a cup of tea was passed to him, but then watched in horror as the man hurled himself 100ft to his death. Mr Hone said: ‘I managed to yank him back but he wriggled to the edge of the stanchion. A lifeboat went to help the stricken man but he was pronounced dead in the water. I adored this woman. I used to watch “Designing Women” with my mother as a child. Dixie Carter’s monologues as Julia Sugarbaker were mesmerizing and legendary. Her delivery, her cadence, her vocal tonality, everything about the way she spoke was divine. It’s odd, but she was an early influence. This is easily the stupidest thing I’ve had to write about all month. Sigh. Earlier this week Jim Hoft announced that citizens of the 3rd district were going to hold a candlelight prayer vigil outside of Russ Carnahan’s house. It made the news. It wasn’t like it was secret. People wanted to pray that Carnahan would be less hard-hearted and more receptive to the will of the people. A small coffin was brought along so symbolize all of the people who’ve died from rationed, government care. From the video I saw, it was a small, earnest affair. After our representatives have flouted the law of the land, they’re suddenly shocked that others allegedly have too, be they actual conservatives or Democratic plants (wouldn’t be the first time in a long, documented history of times). The jury is still out but as we’ve seen in the past week, the real angry mob of socialist enforcers like to grab their pitchforks and start witch hunts – the exact same profiling and stereotyping that led to the Gladney beating. I guess some on the left never learn. I’m left to assume that Carnahan just wanted sympathy from this because it boggles the mind how (or why) someone could twist a prayer vigil into a “threat.” I mean, unless you’re afraid of God and honestly, after voting for legislation that includes (by Kathleen Sebelius’ own video-taped words and her “accounting procedure” admission of last year) means for abortion funding, I would be afraid to answer to God for that charge at the pearly gates. This is a guy who ignored how myself and other conservatives in this area were threatened last summer simply because we dissented with this administration’s policies. His own mother, Jean Carnahan, threw fuel to the fire and tried to whip the vitriol to a frenzy when she attacked his constituents and said that the “teabagger” remarks “bordered on treason.” This is a man who had one of the most under-reported (not to mention caught-on-tape with police report) hate crimes ever to happen at his town hall and the next morning he denied its existence in a press conference. Now this man is going to add further insult to injury by making up malicious intent for people having a prayer vigil? What does he hope to gain from this? Meanwhile, in St Louis, a man actually beaten in an act of political violence by Carnahan’s political allies still waits for justice while his attackers feast on workmen’s comp and have expensive criminal lawyers representing them. Carnahan, despite his shockingly weak claims, is safer than any Tea Party protester at an event with SEIU union members. This is sad. I realized that Russ Carnahan lacked concern for citizens by acting as a stamp for Pelosi and this administration but I thought him at least above going after his own constituents this way. Hey reporters: Did you ask Carnahan’s people to show you the coffin or a photograph of the coffin? Of course not. Nor can Carnahan’s people produce the coffin or photo thereof. That’s because there was no coffin left on Russ Carnahan’s lawn. Now, I wouldn’t put it past Russ and his crew to go make or a buy some coffin and take pictures of it. Anyone could do that. But ask Sara Howard—a Carnahan aide—where the coffin is now. Ask her to describe it. Remembering Cheryl Sharp, the formidable woman who fulfilled her duty on earth, raised a truly great patriot in her son, and was called home. Unbelievable. Heart-breaking. Click the image for the report. The reporter mentions how the U.N. is aware of the orphans’ location and how the U.N. Secretary General, if he is in Haiti, needs to “save the lives of those children.” That’s scary, given the United Nations’ history and overall incompetence. I put my faith in the countless missionaries, charitable groups like the Red Cross and Compassion International before the wannabe world body. 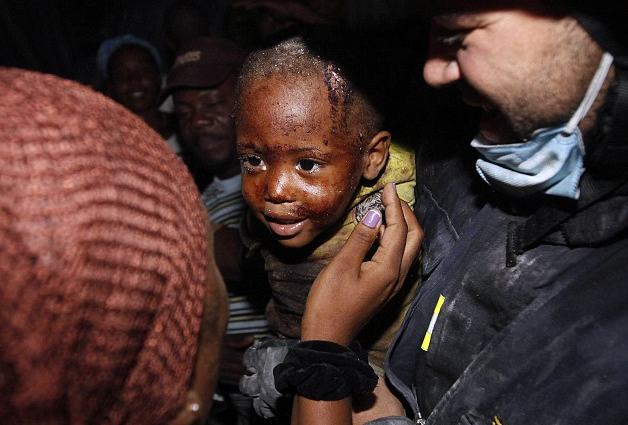 Keep Haiti in your prayers – especially its youngest and defenseless. *Updated: Another reason to discount the U.N. They’re shooting people who are trying to get food. … for more of this. For more reunions. For more released alive from the debris. For the cries of the children buried in the rubble to be answered. The photos of these precious babies get me the most. These people are not responsible for their corrupted government; they are people with whom we share this planet and when tragedy strikes it is a beacon to all of us to step up. That stirring in your soul is resonance. Be not distracted by your perceived smallness or seemingly inconsequentialness of your response. Nothing is small, nothing is inconsequential in matters of the heart.